Shrimp is one of our favorite seafood and we particular like how versatile it is to work with. Not only does it cook quickly, it takes on flavors easily too. The sweet and sour sauce is easy to whisk together and is a nice blend of flavors - not too sweet nor sour. Also cooking with dark sesame oil really adds a depth of flavor and hint of smokiness to the broccoli. 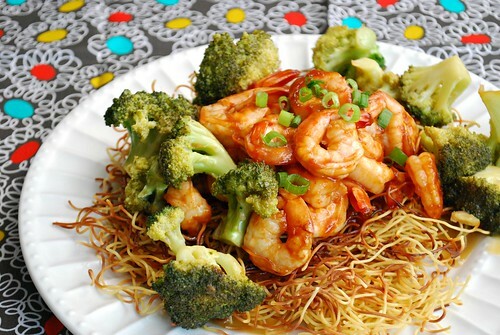 You could toss both the broccoli and shrimp in the sauce, but I prepared it below with the broccoli without the sauce so I could retain that sesame oil flavor. Also, you can serve over rice or crispy noodles. When I prepared this, I had both - rice for me (gluten free) and thin pan fried Chinese egg noodles for my boys. Combine 1 tablespoon cornstarch and shrimp in a medium bowl, set aside. In a 2-cup measuring cup, combine remaining cornstarch, broth, soy sauce, sugar, rice vinegar and chile paste; set aside. Heat sesame oil in a large nonstick skillet over medium-high heat. Add the broccoli florets and saute for 3 minutes. Add water, then cover, Cook for 3-5 minutes until broccoli has steamed and water has evaporated. Add the canola oil over the broccoli, followed by the shrimp. Stir fry for 3 minutes until and cook for 3-5 minutes, until shrimp is cooked through. Remove broccoli and set aside.